Babblings of a Mommy: New In Beauty: Burt's Bees Intense Hydration. New In Beauty: Burt's Bees Intense Hydration. In the fight against dry skin, nature is your fiercest ally. 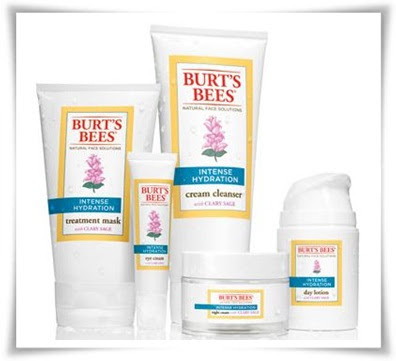 That's why Burt's Bees is introducing their newest line of skin care products Intense Hydration with Clary Sage. Just like the rest of the brand's products, this skin care line is carefully crafted from the best ingredients nature has to offer. Clary Sage, a remarkable botanical that thrives in its harsh environment because of its ability to retain moisture, is the inspiration behind Burt’s Bees Intense Hydration, a natural ode to soft, supple, revitalized skin and the best natural anti-aging solution. Our cream cleanser leaves your skin incredibly soft while our day lotion, eye cream and night cream help reduce the appearance of lines and wrinkles. Add the treatment mask for an immediate dose of hydration to give your skin a revitalized look. This line is great for anyone who looking for natural face products with lots of moisture. All their products have a thick heavy consistency that might aid in a need in the relief of dry skin. I'm not particularly fond of the smell, but it's not too overpowering that it becomes distracting. If you have very dry/chapped skin this a line for you. If you have combo or oily skin I would probably skip this one. Burt's Bees Intense Hydration is available at mass retailers, drugstores, and grocery stores, and prices range from $10-$18. Good info! I'm a big fan of burt's bees.